The idea for this project came from a wonderful blog that I found years ago. I have to share it with all of you mostly because this woman is amazing. She is so crafty just like we are and we get a lot of super cool ideas from her. 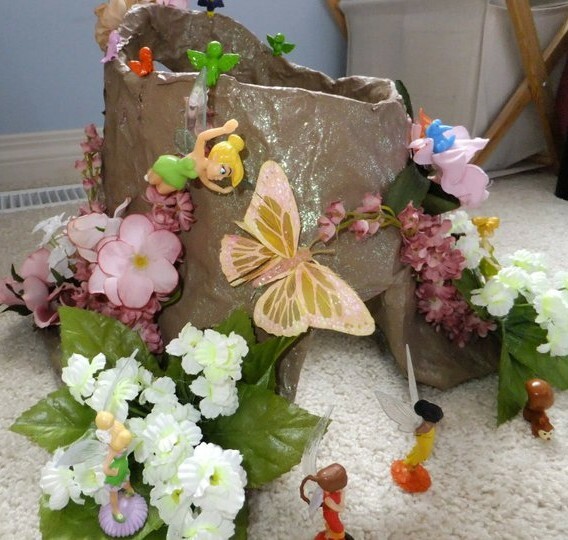 The Pixie Hollow that she made was created out of salt dough. I have tried working with salt dough for other projects, but I have had very little luck. I think that either the weather here is too dry, or I am just not making it right. 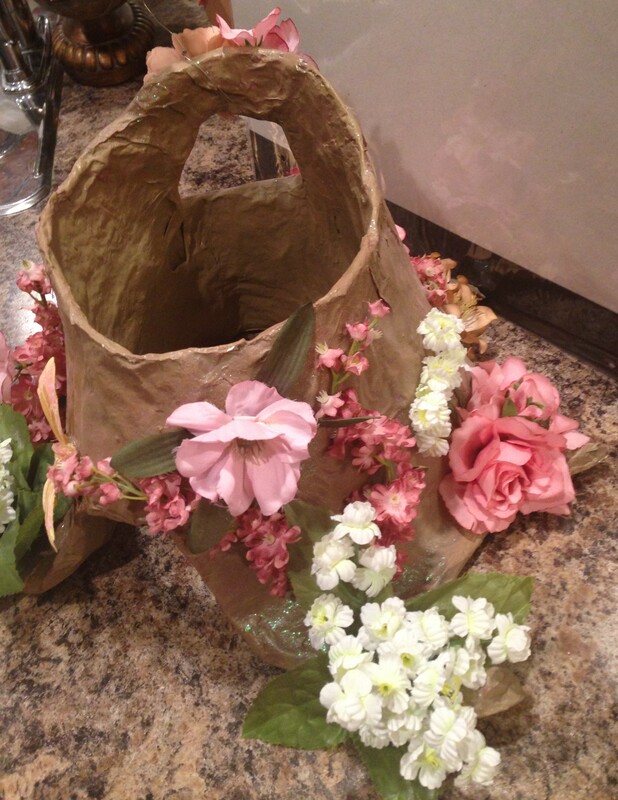 So instead, I decided to use papier mache. I love papier mache. I don’t like the mess that it makes, but the finished product is amazingly sturdy. If you make them right, they can withstand years of use and they are so lightweight. I won’t go through a long tutorial here as you can just check out the bloglink above for a lot of the painting ideas and other details. Instead I will just give a short procedure. The first thing to do is grab some aluminum foil and a gallon paint can. Wrap the foil around the can a couple of times. (Not too tightly as you will want to remove the can eventually) Foil is pretty easy to shape so this part is pretty easy. Next fashion some roots. None of this has to be perfect. 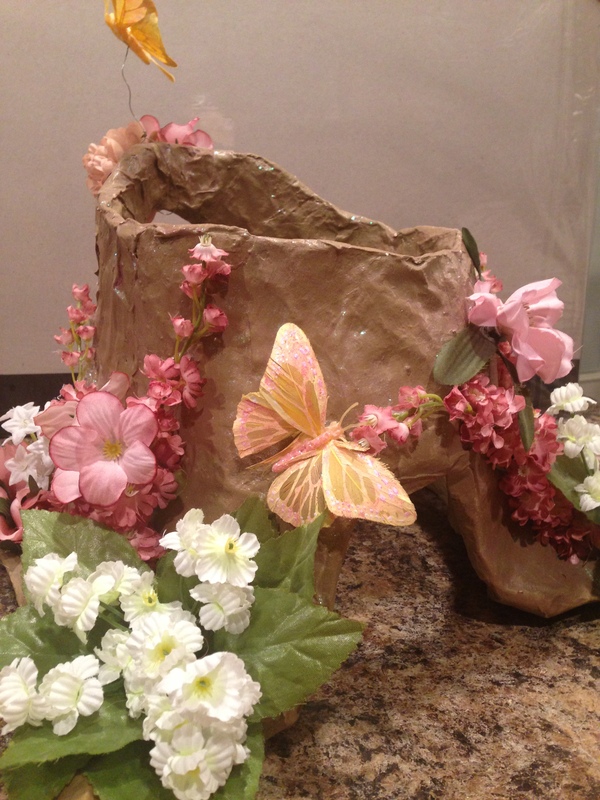 That is the beauty of working with papier mache. It is very forgiving. The blog above does all of this with salt dough, but it is quite easy to shape aluminum foil into roots as well. Attach them as well as you can around the bottom of the foil that is still wrapped around the paint can. Do not remove the paint can. Begin laying the strips of papier mache. I placed the strips vertically all the way around the foil stump. Once the outside is covered, remove the paint can and begin layering the inside. 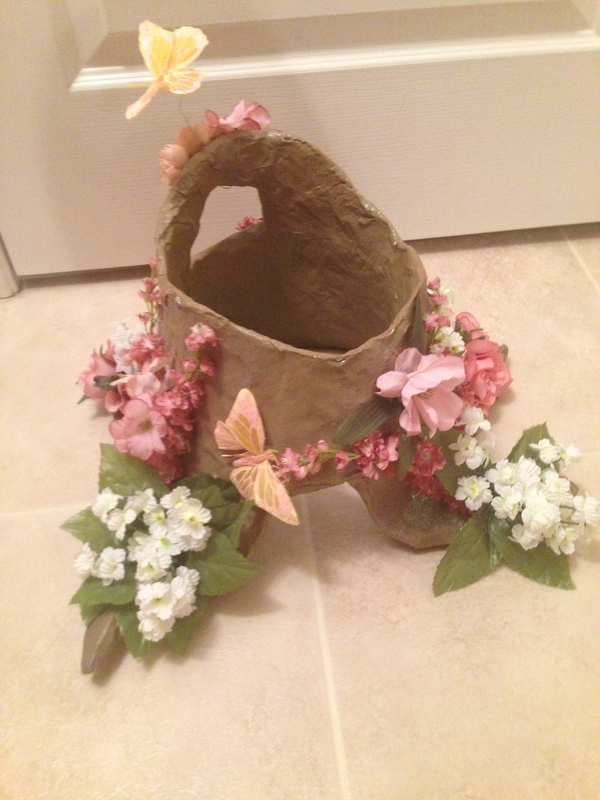 I used a whole ton of papier mache strips. The strips are the easiest to work with. You want to make the stump pretty thick so two or three layers is necessary. Don’t worry if it still seems a little flimsy. This stuff dries as hard as a rock. And here is our finished product. After the papier mache was dry, we painted it with regular craft paint. Then we added some glitter paint and finally, we varnished the entire thing. 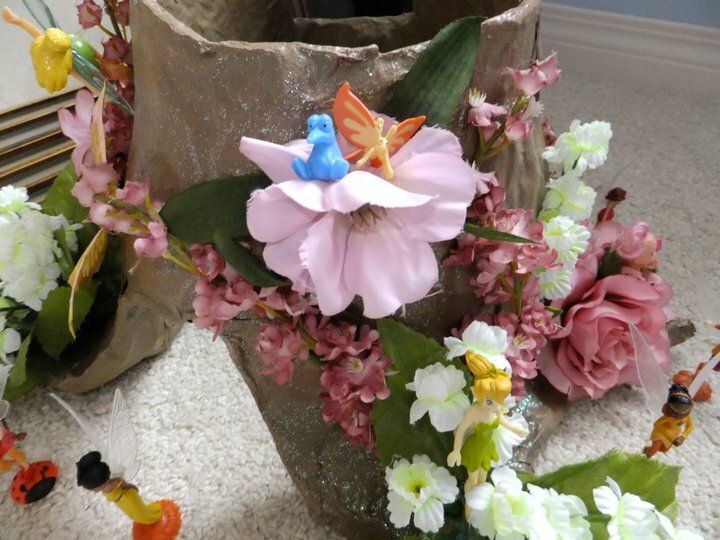 As for foliage, we gathered up every fake flower and butterfly that we could find and just hot glued them all on there. For some reason I had a lot of them on hand from other crafts. I think it turned out pretty great! 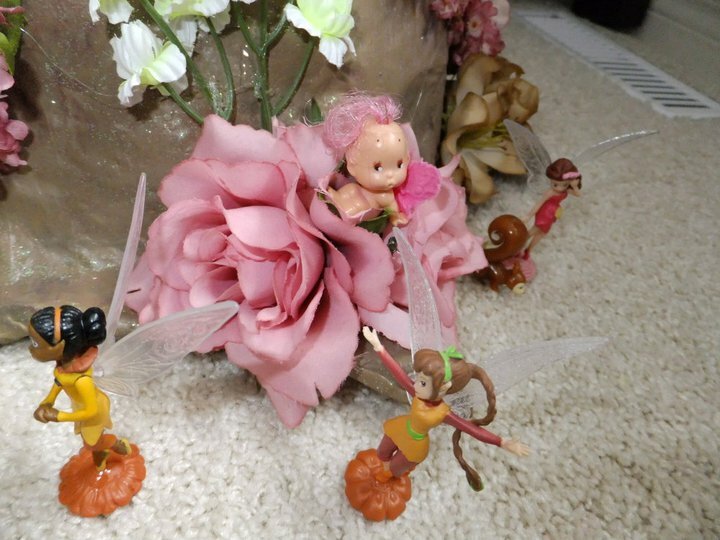 The fairies have moved in and are very happy in their new home! Why don’t you make one for your little fairy? It’s so much fun!